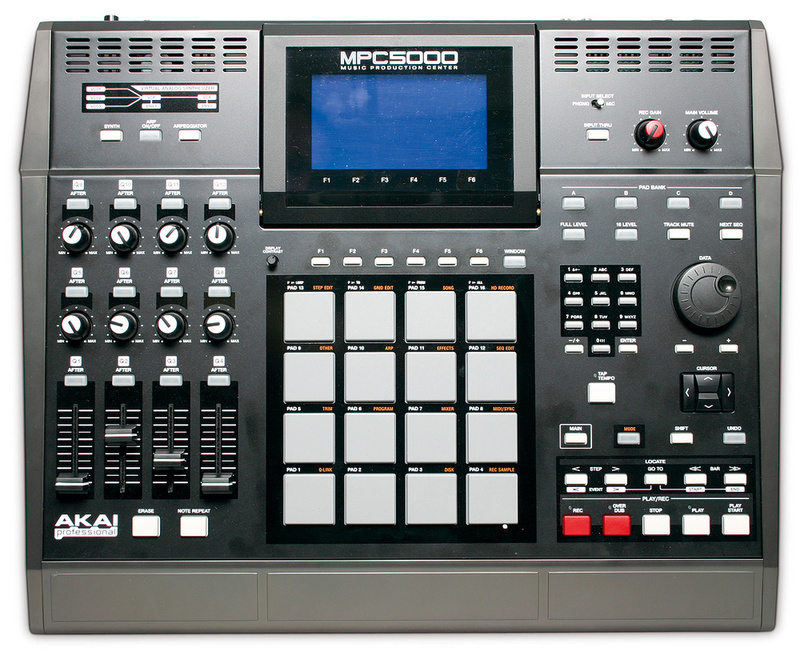 Akai's MPC has been with us for 20 years now — an incredibly long time in music production. 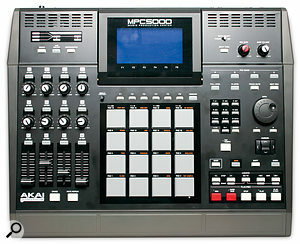 So is the latest addition to this venerable range, the MPC5000, a worthy bearer of its standard? Akai's MPC range has played an important part in the development of hip-hop music, and these solidly built sampling sequencers have also made inroads into a lot of other electronic styles, particularly where live performance is the order of the day. The latest in this noble line is the new MPC5000, a beefed-up big brother to the MPC2500 (and not, as some might guess, a sequel to the MPC4000, which was rather the black sheep of the MPC flock, more related to the Z-series samplers, and discontinued some time ago). Like the MPC2500, the philosophy of the machine revolves around the pairing of a 64-track MIDI sequencer with a streamlined 16-bit/44.1kHz drum/phrase sampler, all housed in a desktop unit controlled using the obligatory 4x4 pad matrix and assorted buttons, knobs and sliders. Because a lot of this basic functionality was dealt with in my MPC2500 review back in the January 2007 edition of SOS, let me refer you to that for an overview of how the MPC concept works, so that I can concentrate on the expanded features of the MPC5000 here. Measuring 9.7 x 41 x 41cm (HxWxD) and weighing in at 18.2lbs, the MPC5000's hardware immediately makes its tribal 'alpha' status clear, with doubled LCD–screen acreage and a tripling of the Q-Link control count. A less visible enhancement is that an 80GB hard-drive is now included as standard, which works alongside any suitable card you insert into the onboard Compact Flash slot and the optional CD-RW drive. The USB connectivity has also been streamlined to make both the hard disk and Compact Flash drives accessible as external drives from your computer simultaneously. The Flash ROM that I liked on the MPC2500 is present too, but while I could delete things from it, I couldn't actually save anything there, which is a shame. A final interesting addition is the ADAT lightpipe connector, which can transfer the MPC's eight individual outputs (or the main outputs and individual outputs 3-8) digitally to other studio equipment. When used alongside the existing coaxial S/PDIF connector, this could give you 10-channel real–time digital transfer, something I can imagine appealing a great deal to those beat–makers who start productions on the MPC but then migrate to something like Pro Tools for overdubbing and mixing. The new machine's sound generator can not only do pretty much anything that the MPC2500 can, it can also do it better. Doubled 64-voice polyphony and an increase in the standard and maximum RAM figures (64MB and 196MB respectively) are very good news, as is the expansion of the MPC2500's single–track–only Continuous Sample playback option to cover up to 64 tracks. A nifty little addition in Program mode allows you to set a Pad's four sample Zones (which normally trigger according to incoming velocity values) such that the samples are played one at a time with each successive hit — either delivered randomly or in order of their Zone number. This is a great idea, and will, for one thing, help widen the appeal of the Note Repeat function by eliminating much of its traditional 'machine gun' feel. In terms of Program-level sample processing, there have been changes to the filter algorithms to make them more flexible. Although the new routine dispenses with the dual-filter setup of the MCP2500, what you get in return is much more control over the filter shape and response. Available filters include: low-pass, high-pass, band–pass, band-stop, band-boost (a EQ-style peaking filter), three modelled filters (based on various desirable analogue circuit designs), and three vocal formant filters. Each of these options gives you the cutoff and resonance controls that you'd expect, but also offers you one-, two-, four-, or eight-pole filter slopes, which is great — the steep eight-pole pass filters are wonderful for carving away what you need from ensemble samples, while the one-pole option is great for subtler effects more along the lines of EQ. The MPC's two MIDI inputs and four(!) MIDI Outputs betray its heritage, but also found on the rear panel are some new additions to the MPC family: combi XLR and jack sockets so you can record balanced mic and lin-level signals.In addition to the increased sampling horsepower, you can now add further sounds to your arrangement from a built-in multitimbral 20-voice polyphonic virtual analogue synth. It's a pretty well-specified beast too, with three oscillators, two LFOS, two ADSR envelopes and the same updated filtering available to the sampler. Waveforms available for each oscillator include sine, variable sawtooth/triangle, variable pulse and three varieties of noise, and considerable extra sonic mileage can be achieved from these sources via oscillator sync, ring modulation and cross modulation (which is frequency modulation by another name). A variety of hard-wired modulation routings are available to make patches more expressive, not only to cater for the internal LFOs and envelopes, but also to utilise incoming MIDI aftertouch, pitch-bend and mod wheel controller information. All these programming niceties notwithstanding, if you're after quick synthesis thrills you'll probably just head for one of more than 300 synth presets included on the internal Flash ROM. I say 'quick thrills', but they're not quite as quick as they could be, because you have to load synth programs into memory and then assign them to the current track (just like sampler programs) before you can play them. You can load up a whole folder at a time, which makes things a bit quicker, but you'll use up your 128 Program slots well before you exhaust the supply of synth Programs, and then you'll have to faff around deleting surplus Programs to free up space if you want to hear any more. Every sequencer track has a built-in arpeggiator, which will, of course, find most obvious application in conjuction with the synth programs. You get a choice of half a dozen patterns, with step size, octave range, hold, and swing parameters for each. You can also specify whether notes will be arpeggiated in the order and with the velocity values they were played with, and there's a Latch function so you don't need to keep holding notes down. Lots of the usual Tangerine Dream-style fun is to be had with this arpeggiator, and it's a nice bonus that you can use it with sample programs and external MIDI hardware as well as synth programs. A small fly in the ointment, however, is that you can't internally bounce the MIDI output of the arpeggiator for fine editing, which is a shame, especially given that one of the arpeggiator pattern options is 'Random'. Amongst all the new features, Akai's most triumphant marketing fanfare has been reserved for the all-new built-in multitrack recorder, which allows you to layer up to eight tracks of linear recording alongside your sequenced backing track. You can record up to two of these tracks at a time, from analogue or digital inputs, and you can also bounce down any of the instrument's stereo output buses: main stereo, 1&2, 3&4, 5&6 or 7&8. Once recorded, the multitrack audio can be viewed and edited in much the same way as sampled audio, but with a smaller number of available editing operations: Gain, Fade, Cut, Copy, Paste, Normalise and Silence. Further to these editing options are Import and Export, the latter allowing you to dump any section of a track to disk as a separate WAV file, at either 16- or 24-bit resolution. This would, of course, let you subsequently re-import that audio into the sampler to take advantage of the more powerful sound-mangling capabilities on offer there. The mixer for the hard disk tracks is much the same as for the sample tracks, with output assignment, effect send, pan, mute and fader controls. Although, on the face of it, these new multitracking facilities would appear finally to transform the MPC5000 into a one-stop hip-hop production workhorse, in practice they're a bit diddy, and I wouldn't suggest for a moment that you do away with your other recording/mixing systems just yet. For example, some dull-but-important multitrack-recorder functions are missing, such as auto-location and automatic punch–in. Then, once you've recorded your audio, you can only hear it while you're actually in the special HD Record mode — exit that mode, perhaps to tweak the sample and synth programs in response to the new audio, and you aren't able to hear the multitrack any more. There are also limitations from the mixer perspective, in that, unlike sampler Programs, audio tracks don't have any standard processing facilities, even basic EQ, so you'd have to use the internal multi–effects for any such processing, and even though those have been upgraded, there's still only so far they're going to stretch. Plus every mixer channel in the entire machine has the ridiculous limitation of only one effect send, so you can forget mixing with a couple of different global send effects. Furthermore, because the only way to implement an insert effect on any channel also ties up its single send, you can't have an insert and a send effect on the same channel. So your vocal tracks can have insert EQ/compression or share a global delay/reverb, but not both. In a word: daft! All that aside, at the very least the new multitracking functionality does provide the welcome opportunity to work up basic vocal arrangements for demo purposes, and to bounce down stems from the unit's individual outputs internally. It also allows you to capture audio in a linear fashion that is slightly more advanced than the existing Direct Recording sampling mode, and then to import it into the sampler for general mangling. So DJs can scratch away to their hearts' content alongside their tracks, and then cherry-pick only the wickiest of wicki-wickies to fly in as samples on the final cut. With its 16 grey pads, the 5000 is instantly recognisable as an MPC — but with all the new functions it can feel as though Akai are perhaps stretching the traditional MPC interface a little too far.In concluding this review, I find myself torn between differing opinions. On the one hand, if you already like the MPC2500, then you should like the MPC5000 even more. It provides the same straightforward and streamlined hip-hop and electronica production tools, with more sampling and processing power and some nice extra bells and whistles. The added synth and arpeggiation powers are stand-out features, and the multitrack recording function makes a handy sketch–pad, despite its obvious lack of frills. But on the other hand, I can't help feeling rather despondent about this latest incarnation of the MPC brand, primarily because of the way the ever-expanding feature-set is straining the seams of the ageing user-interface design. Akai seem to have spent much of their development time trying to add new functions to justify the higher price tag, but in doing this they haven't also brought about commensurate advancements in the operating system, in my opinion. Although the basic features still work pretty much as quickly as they always did, the moment you start to delve into anything more complex you begin to feel as if Akai's software designers haven't been paying very much attention to what's been going on in interface design over the last 20 years, and this means that there's more keypad tap-dancing to do than you'd ideally want. The Shift key on the MPC5000 is also woefully under-used, condemning the cursor keys to a great deal more bashing than should really be necessary in this day and age, and requiring lots of parameters to be tucked away into the increasingly cluttered Window-key closet. Akai should take a lesson from their competitor Roland — Shift-key combinations can dramatically speed up workflow for more experienced users. To be fair to Akai, their Q-Link controls are drafted into use in a number of screens to give quick access to editing parameters, and this works particularly well in the mixer, effects and synth-editing screens. But where are these kinds of time–saving features in the main Program mode, which is, after all, the heart of the machine? 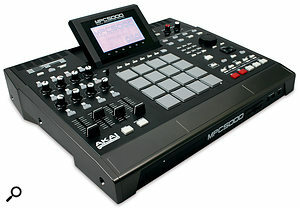 It also seems to me that the more Akai try to expand the feature set, the less competitive the combined result gets. For example, while the mixing facilities are alright for a drum sampler, they're nowhere near up to the job of mixing a complete multitrack production. Why upgrade the input facilities and add multitrack recording without offering phantom-powered mic inputs? Why bother upgrading the effects themselves when the effect assignment system is so compromised? So I have to say that I can't wholeheartedly recommend this machine unless you're already addicted to the MPC–family approach and are primarily after just more MPC2500 in a single box. Other users are understandably going to be pretty demanding of a purchase at this price point, and I reckon that the MPC5000 is going to have trouble competing well against mature and powerful keyboard–workstation products from Korg, Yamaha and Roland. It faces a strong direct threat from Roland's MV8800 as well — a powerful machine that I found more pleasant to use overall when I reviewed it back in the October 2007 edition of Sound On Sound. What's not easy to factor in, though, is whether the undeniable cachet of the MPC brand will guarantee solid sales of this new unit regardless. I, for one, have my doubts. The MPC5000's price puts it into competition with the biggest predators in the workstation market: Yamaha's Motif XS6, Korg's M361 and Roland's Fantom X6 are all breathing hungrily down the MPC's neck. In addition, there's direct competition from Roland's MV8800, heavily inspired (to say the least) by the MPC's own modus operandi. Despite the annoying constraints on effects routing and assignment in the mixer (see the main body of this review for more details), the 5000's raw effects processing power itself has been upgraded, allowing you to set up four stereo effects buses, each with up to two effects. As on the MPC2500, there is also further EQ and compression over the master output, independent of the contents of the four multi-effects buses. You're not entirely free to choose which effects to combine within the four multi-effect buses, as the amount of DSP power is limited, but there's a CPU meter to show how much power you've got left, and from my own tests it looks like you're only in danger of maxing things out in the unlikely event of running four double–reverb chains simultaneously. That particular restriction is probably for the best anyway, as the reverbs here are not very nice at all (very much in the tradition of MPC built-in reverbs). There are, however, lots of new effects algorithms to choose from besides, including a useful selection of compression, EQ, modulation, delay and distortion effects that should cover most everyday eventualities. However, there don't appear to be any presets provided, and there's no way to save your own favourite settings either, which will be tedious for some. The MPC5000's Flash ROM contains a very slim selection of samples — mostly acoustic and electronic drum sets, including those evergreen Linn, CR78, TR808 and TR909 sounds. However, on the hard drive there are three folders of other samples from well-known sample-library developer Loopmasters: the first includes mapped kit Programs; the second subfolders of themed drum hits; and the third a selection of complete loops from eight of the company's commercial libraries. There's lots of good stuff in there, and the drum hits, in particular, cover a lot of ground, from natural-sounding acoustic hits, through weird and wonderful processed specimens, to analogue synth curios. The loops are usefully already saved in the MPC's Patched Phrase format, so they're easy to slot in at whatever tempo you happen to be using. While this is all well and good, I couldn't help wishing that the machine came with a decent set of multisample Programs. As it is you get a five–octave piano and some ensemble strings in the Flash ROM, alongside whatever you can draw out of the new synth, which feels a bit stingy. A few extras have found their way into the MPC5000's sequencer, the most obvious being the new Piano Roll editor display, which supplements the Drum Edit screen already added in the MPC2500. Beyond the different vertical axis legending, the only thing that really separates these two different views is that note durations are shown in the Piano Roll, so there's not much more that needs saying on the subject. However, under the sequencer's bonnet there's been another significant upgrade for anyone obsessed with groove: the sequencer's timing resolution has been magnified tenfold to 960ppqn. The most MPC you can currently get in one box. Added multitimbral synth, as well as an arpeggiator for every track. Eight-track hard disk recording with XLR mic inputs and ADAT multi-channel digital output. More sampler polyphony, more flexible filtering, new Zone-playback options and automatic slicing of stereo files. Redesigned effects provision with four separate multi-effects buses and new processing algorithms. Very basic hard-disk recording facilities. Under-powered mixing environment with restrictive effects assignment possibilities. No phantom power on the new mic inputs. Beat-slicing routine is annoyingly haphazard. The new MPC is more powerful than the former MPC2500 flagship and has some nice extra features, but its idiosyncrasies are harder to swallow at this price, in the light of competition from keyboard–workstation heavyweights such as Yamaha, Korg and Roland. Akai professional (USA) +1 401 658 4032.